Nicole Zeiss knew her pay phone could be ambushed at any moment, so she guarded it diligently. With one hand on the receiver, Zeiss, a 36-year-old Manhattan lawyer, looked up and down Broadway for fellow warriors. Across the street, Juan Carlos Belair had seized a pair of adjoined pay phones. "That means we get double the points," Belair said, panting. "Game's over!" Zeiss yelled after a few tense minutes, abandoning her phone and jogging across the street to join Belair. They high-fived. Belair, 37, who works for a mobile phone company in Mexico, was teamed with Zeiss in a super-sized, frenetic version of the childhood game Capture the Flag called Payphone Warriors. Equipped with handfuls of quarters, each team sets out to capture (by dialing a number and the team's extension) pay phones within a three-block radius and control them for longer than other teams. The game was one of dozens hosted by the Come Out & Play festival, which sought to transform Manhattan into a high-tech, urban playground. And how. In midtown Manhattan last weekend, more than 150 New Yorkers paid compliments to strangers in hopes of routing their enemies. 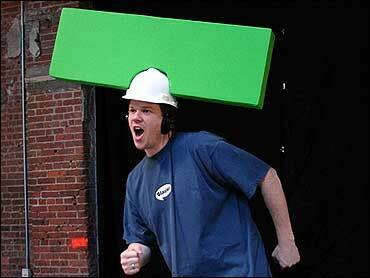 In the Chelsea neighborhood, two men with green blocks on their heads jockeyed along opposite sides of a large art studio space, hoping to hit a ball of sound. Real balls were in play on sidewalks of the East Village, where golfers attempted to avoid obstacles such as cabs, fire hydrants and baby strollers. They are called "big games." Making use of the spaces between skyscrapers — think of benches, scaffolding and Starbucks as components of a giant urban playground. Check out footage from the games. An estimated 800 to 1,000 people participated in the weekend festival's 20-plus games. The appeal is something between that of a public bike ride and the trendy flash mobs of 2003. Most of the players were young professionals, artists and technology enthusiasts. News of the games spread online, mostly on blog sites such as What's Up: NYC and digg.com just days before the festival. Locations and game details were kept quiet, too; they were sent via text message only to participants. Big games are generally on the scale of city blocks rather than pixels or board game squares. There is a philosophy to setting the games in tight urban places that leads to talk among enthusiasts, such as New York University professor Frank Lantz, who teaches a class on the subject, of "altering the urban landscape" and "putting public space in play." "Everyone pontificates about the theory behind all this, and how it changes urban space, yadda, yadda," said Greg Trefry, one of the festival's organizers, who studied under Lantz. "But what hooked me is running down the street jumping over garbage cans. I thought, 'Wow, this is just the highest-resolution game you'll ever play, and this is really fun.' "
Several of Lantz's former students, including Dan Phiffer, 26, contributed games to the festival. Phiffer worked with other students and designers to make a guided tour of Baghdad, Iraq — using the streets of Manhattan. "We became interested in layering spaces on top of each other. It's a project about extracting space, because when you're in a city, you're really just in a place, in a spot on a map that could be anywhere," Phiffer said. In You Are Not Here, a player sets off with a map of Baghdad that has a reversed map of Manhattan printed on the other side. When the player holds the paper to a light source, it reveals that "tourist spots" of Baghdad — including the Baghdad Zoo or Iraqi National Theater — correspond to locations on the Manhattan map, such as Grand Central Station. By dialing in a code to a cell phone, players who reach a designated location receive a guided walking tour of Baghdad. Although Phiffer says he was "pretty nervous at first about putting stickers" up marking the landmarks, his game seems innocuous in comparison to others. Players of the game Insider took to Wall Street near the end of the business day Friday with pockets full of fake money. Within an hour, they were racing through the financial district, looking for insider tips on their shadow stock market, getting baffled looks from the real brokers. Saturday, south of Central Park, teams of players ganged up on strangers in order to pay them compliments in a game called Cruel 2 B Kind. Philip Buuck, 25, and his team were told via text message to try to assassinate their opponents by shouting at them "way to go!" Other teams were instructed to ask passersby if they needed help or compliment peoples' shoes in hopes of finding their intended targets amid the foot traffic. Teams started out as pairs, but near the end of the game, groups of 30 or more people were shouting unexpected words of praise to surprised pedestrians. "I heard one woman who was walking by say to the guy she was with, 'I don't know, honey. I'm just trying to stay away from them,' " said Buuck. During the downtown game of commandeering pay phones, Chrysanthe Tenenetes, a 26-year-old magazine intern, said she got a lot of strange looks when bolting from one phone booth to the next. While "the peanut vendor on Broadway was pretty amused," some Greenwich Village residents were not. "One woman was trying to use the phone – I didn't know anybody actually used payphones anymore. I tried to get her to leave, like to signal something big was going on here, but she was really adamant." Tenentes said. "Eventually, I just gave up." Instead of irking pedestrians, some games drew crowds. A staged séance — part of The Go Game — on a busy West Village street Sunday attracted tourists, who joined in the circle of players who were hoping to get clues from a lavishly costumed storyteller. Nearby, a batgirl lurked on a bench. She bolted, head under caped arm, into the entranceway of a Banana Republic when another Go Game team approached. The teams were to search out the batgirl and photograph her in scandalous tabloid style. "We got all sorts of photos, like a Kate Moss style coke-off-the-stomach shot, and one of another team 'unmasking' me," Donita Beeman, an actress hired for the game. "But then tourists started asking me to pose with them, too. I guess its not every day you see a masked girl running around in a black bodysuit."